Though Cologne famously contains 12 Romanesque churches, the city's top prize remains its landmark Gothic cathedral. Its twin spires helped secure it a spot on the World Heritage list. 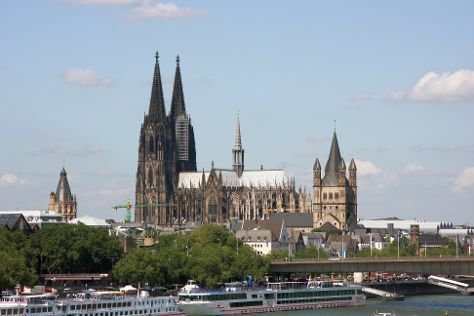 Cologne was established nearly two millennia ago as the capital city of an ancient Roman province. This major cultural center is home to more than 30 renowned museums and hundreds of art galleries. The city's deep appreciation for fine art allows residents and tourists to experience a wide range of exhibits from showcases of local archeological artifacts to interactive exhibits of contemporary graphics to modern sculpture. Regarded as one of the nation's most liberal and diverse cities, Cologne thrives as an ever-expanding media, tourism, and business hotspot. Reduced to rubble at the end of World War II, Cologne now boasts a cityscape of ancient Roman walls, restored medieval churches, and avant-garde structures. Cologne is in North Rhine-Westphalia. Take stress off the schedule by using our Germany trip planner .